Thai cuisine is one that has been greatly influenced by all its surrounding neighbors. To me the most obvious influence has been from Indian cuisine, and this is because of the spices — and though very different but still similar, the curries. Thai food is unique in that it has created this perfectly well balanced harmony of five flavors that are present in every dish or in every meal. The flavors are salty, sweet, sour, bitter or aromatic, and heat or spicy. The five flavors are not particular to that order. 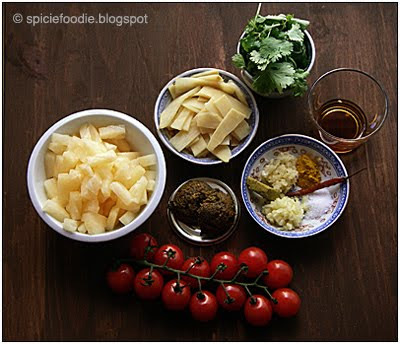 Some examples of how these flavors are brought into a dish can be salty from shrimp paste or fish sauce, sweet from sugar or sweet fruits, sour from lime juice, bitter can come from bitter melons or aromatic herbs and green vegetables, heat of course from chilies or curry pastes. Though not included in the five main flavors, but quite common in many dishes is the sweet and creaminess of coconut milk. Today I have a recipe to share that is a big favorite of not only mine but my husband and one of our frequent dinner guest: Thai chicken pineapple curry with cherry tomatoes and bamboo shoots. Just writing this makes my mouth water. It so easy and fast to make, I guarantee they’ll want seconds. The curry paste I used is my own from the previous recipe found here but you may use store bought if you’d like. 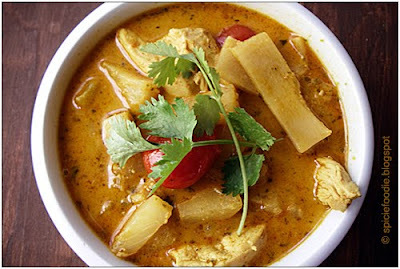 Covering the essentials of Thai cuisine we have a deliciously fruity, spicy and sweet, creamy curry with aromas that will have them all running to the dinner table. Done.When serving you can add a couple of fresh basil or cilantro leaves for decoration. Serve with steamed white rice. Makes great leftovers, that’s if you have any left. - Tip: You can use drained canned pineapple if fresh isn’t available but it taste so much better with fresh. 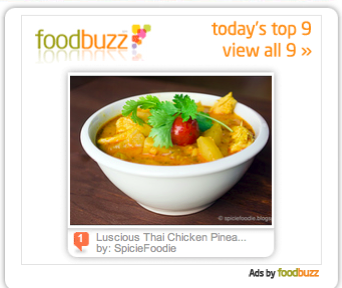 Update:9/9/09 ~My Luscious Thai Chicken Pineapple curry and the 5 flavors of Thai cuisine is #1 on the Foodbuzz top 9 today, buzz worthy wouldn’t you agree?! My Luscious Thai Chicken Pineapple Curry recipe was chosen to be included in this beautiful cookbook. There are many talented bloggers in this book and it is a great honor to be among them. You can find me recipe on pages 90 and 91.
hmm hmm I love pineapple curry! I can practically smell it –or maybe that's the split peas in coconut milk and curry I'm slow-cooking today. Curries rule! wow, this looks and sounds amazing! i'm definitely going to try it! pineapple and curry are a match made in heaven in my opinion!!! I'm glad you all share my enthusiasm and love of curry :) CheapAppetite thanks for that tip, I did forget to add that the curry can be simmered longer under low heat. But you taught me about the coconut oil separating and it being very desirable in Thai curry, so thank you. Kelly I love curried splt peas but never added coconut milk, sounds good. Let me know if it's on your blog so I can see your recipe,please. I love Thai food. This curry sounds delicious! Congrats to making it to No. 1 of the Top 9! Great job! That looks like a beautiful dish. It just got a bit cooler here, so perfect time for soup! Made this tonight… it was very good but way hot! Out of 6 people I was the only one who could stand the heat. Next time I'll use half or even less curry paste. Thanks for the response! I actually used a store-bought red curry paste from a local Asian store. I wasn't sure how hot it was until everything was already in the pan. I made this with 5 fresh hot thai bird chilis and 2 regular hot red peppers, and curry paste (roasted and regular Thai Kitchen) and it could've been hotter. I used fresh pineapple and left out the tomatoes but added onion. I served it with roasted cashew nuts on top. You were right, no leftovers! It was amazing! Wow,you wanted your curry extra spicy :) Glad you liked it. Yum! Love your blog! 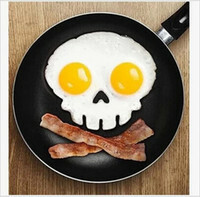 Came across it on foodbuzz & am a new follower! @Jessica, Thank you and nice to meet you :) ! Thanks! The water or broth does comes from the chicken broth and coconut milk. The oil content is quite low, so not much from that. But also the water in the pineapple and tomatoes adds a little more liquid. Ah okay, thanks! That explain it. Wondered if I should add some water somewhere, but will try this recipe. Sounds so delicious! Thanks. Try it with just the liquid that is in the recipe. Then after you have followed the recipe, if you would like it thinner or more soupy then add some broth or water. But, in my opinion it won’t need any extra liquid. Enjoy! This looks so good and I am drooling behind my desk at work. Not good ! Awesome recipe. Another keeper for my curry collection. Thanks very much! One thing however. It doesn’t say in your recipe when to add the pineapple. Oops! Thanks for catching that. You can add the pineapple at the same time as the cherry tomatoes. Enjoy the curry and the paste! 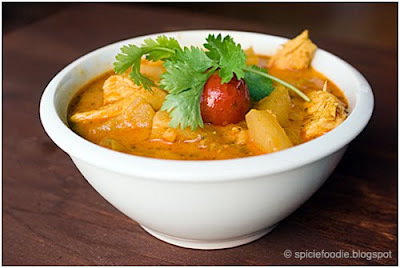 I’ve tried so many pineapple curry recipes, and this is my favorite! Thank you for posting the recipe. Awesome! Thank you Julie, and glad to here you love this curry as much as we do. Good recipe, but at what point do I add the garlic? Just finished the recipe and I can say it is fantastic. I lived for 2 years in Sakon Nakhon, North East Thailand (Issan) and my then wife made a similar dish, more spice and without the pineapple or tomatoes. Sorry for her but your dish wins hands down. I went around to my local Japanese/Korean vegetable store to stock up on Bamboo Shoots, the lady advised me that they are currently out of season here in Brasil although she could do a special order if I bought a large quantity. I explained that I am only cooking for one so I would have to leave them out of the recipe. She advise me to use Peach Palm Hearts as a substitute. Works great, flavour does not come through as much as bamboo shoots but none the less a good alternative if bamboo is not available. Sounds so different and lovely! How many servings does this make? Thank you Jennifer! This serves 3-4 people. Enjoy! Can you use green curry paste with this recipe?